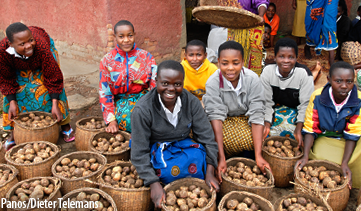 Rwanda has made great strides in reducing hunger. From 1990 to 2015, prevalence of undernourishment fell by nearly half, from 56 percent to 32 percent—a sign of strong, yet incomplete progress. Child undernutrition, in the form of stunting or low height for age is still high. The proportion of child under 5 years of age affected by stunting in Rwanda dropped from 45 to 38 percent between 1996 and 2015. Prevalence of child stunting is higher in rural areas (41 percent) than urban areas (24 percent), and across regions is most prevalent in the Western region (45 percent). A Compact2025 forum was held in Rwanda on October 23, 2017 to follow up on the roundtable discussion of 2016. The forum reviewed opportunities for multisectoral collaboration, evidence gaps, necessary knowledge systems, and accountability mechanisms that are needed for the final result of ending hunger and malnutrition.